By mid-1963, American astronauts had visited space on six different occasions, all as part of NASA’s first human space flight program, the Mercury Program . During the final Mercury mission, launched on May 15, 1963, astronaut Leroy Gordon Cooper logged 34 hours in orbit, the longest an American had spent in space to that point. Still, very little was known about the impact that space would have on humans and spacecraft that were subjected to long-duration missions. With this in mind, NASA decided to follow the Mercury Program with a new initiative called the Gemini Program. On June 3, 1965, Gemini IV astronaut Edward H. White II became the first American to step outside a spacecraft and let go for a space walk, effectively setting himself adrift in the zero gravity of space. For 23 minutes, White floated and maneuvered himself around the Gemini spacecraft; he logged 6,500 miles during this historic orbital stroll. The primary objective of the Gemini Program was to develop techniques that would allow for advanced, long-duration space travel—a prerequisite of the ensuing Apollo Program that would put man safely on the Moon before the end of the decade. 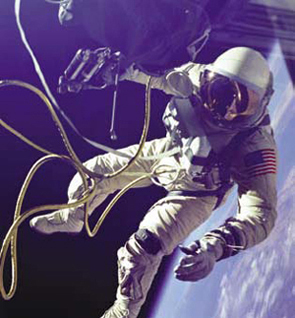 In order to carry out this objective, NASA worked with a variety of innovative companies to develop propulsion systems, onboard computers, and docking capabilities that were critical to the health of Gemini spacecraft, as well as life-support systems and physiological-monitoring devices that were critical to the health of Gemini astronauts. One of these companies was Spacelabs Medical , Inc., the pioneer of what is commonly known today as medical telemetry. Spacelabs Medical helped NASA better understand man’s reaction to space through a series of bioinstrumentation devices that, for the first time ever, were capable of monitoring orbiting astronauts’ physical conditions in real time, from Earth. The company went on to further expand its knowledge of monitoring and maintaining health in space, and then brought it down to Earth, to dramatically change the course of patient monitoring in the field of health care. Spacelabs Medical was co-founded by Ben Ettelson and James A. Reeves in 1958 for the express purpose of working with NASA and the U.S. Air Force on systems to monitor the vital signs of astronauts in space. As a prime contractor to NASA for the Gemini Program, the company manufactured and delivered prototypes of miniaturized signal conditioners to measure astronauts’ temperature, respiration, and cardiac activity. This technology was first worn by astronauts James A. McDivitt and Edward H. White II during their historic Gemini IV flight—the first American spacewalk—to assure proper evaluation of their health and performance. In July 1969, just days after Neil Armstrong become the first man to walk on the Moon during the Apollo 11 mission , NASA’s Manned Spacecraft Center (now Johnson Space Center ) honored Spacelabs Medical with a certificate of appreciation for its “outstanding” contributions to the Apollo Program—contributions which proved vital to successfully achieving the Nation’s goal of landing men on the Moon and returning them safely to Earth. After pioneering medical telemetry in the mid-1960s, Spacelabs Medical began making the transition from monitoring in space to monitoring in hospitals. In 1968, it unveiled its first systems for intensive care unit (ICU) and critical care unit (CCU) monitoring. In 1974, it launched Alpha, the first-ever patient-monitoring system to incorporate digital microprocessor technology. This helped to make patient monitoring faster, not to mention more affordable, since complex systems could now be produced by using smaller, less expensive parts, with less assembly work. In 1979, the company introduced the first bedside arrhythmia-monitoring system, allowing physicians to view real-time arrhythmia data, by the patient’s side, for the first time. WinDNA gives clinicians easy and immediate access to more information and more functions from the patient’s bedside. Entering the 1980s, the company was enjoying accomplishment after accomplishment, as a result of its decision to adapt the technology it originally developed for NASA to commercial use in health care. By heavily investing in research and development, the company was able to dream up new, innovative enhancements that were necessary for it to stay ahead of the technology curve. 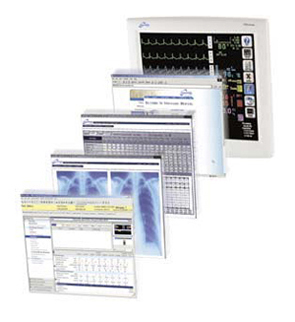 It was during this time that Spacelabs Medical delivered the Patient Care Management System (PCMS) product, complete with a system architecture—incorporating Ethernet communication connections and “smart” touchscreen controls—that was well ahead of its time. In the latter part of the decade, the PCMS product line expanded to include portable, color monitors and remote-access laptops, as well as Flexport system interfaces, which the company reports are the first interfaces to integrate standalone monitoring devices with a larger monitoring network. This technology continued to evolve throughout the 1990s, with Spacelabs Medical making it easier for clinicians to access more information from either the patient’s bedside or from a remote location and, thus, provide better care. Spacelabs Medical’s introduction of Windows Dynamic Network Access (WinDNA) marked yet another milestone in the company’s illustrious career of pioneering patient-monitoring technology. WinDNA is software that provides staff access to and interaction with medicine administration records, laboratory test results, any type of electronic report or chart located in other areas of a hospital, and any Windows program on a hospital’s network. It also possesses Internet and Intranet capabilities, which allow hospital staff to maintain schedules and check e-mail. By allowing seamless data acquisition and exchange across an entire health care organization, this technology improves overall efficiency and prevents caregivers from having to leave a patient’s side to obtain information that is physically located somewhere else. “I can go to the lab, library, and records—and never leave the NICU (neonatal intensive care unit),” asserted a nurse from North Carolina Children’s Hospital, adding that WinDNA is keeping this facility on the cutting edge of patient care. Children’s Hospitals and Clinics in St. Paul, Minnesota, has the largest all-private-room NICU in the United States, due in part to the WinDNA technology, which allows for around-the-clock, remote patient monitoring. This system is linked to pocket-sized, wireless handsets carried by primary nurses, as well as designated back-up nurses, in the event that the primaries cannot respond immediately. Instead of having an immediate-response alarm sound in a patient’s room, the alarm is transmitted, instantly and silently, to the wireless devices. This concept has translated into constant, effective care, all while reducing noise levels and room traffic, so that the infants can progress in a quiet, stress-free, and more natural environment. Spacelabs Medical’s technology has not only created a calm over Children’s Hospitals and Clinics’ NICU, it has affected the staff, too. NICU workers report that they are not as uptight at the end of their shifts and are better able to relax and sleep at home. This patient-monitoring technology has also been embraced by many other health care organizations, including the University of Illinois Medical Center, St. Louis Children’s Hospital, the Nemours/Alfred I. duPont Hospital for Children (Wilmington, Delaware), Lakeland Regional Medical Center (Lakeland, Florida), the University of North Carolina Health Care System, and the University of Missouri Health Care System. In 1999, Spacelabs Medical’s products became the first to operate in the Wireless Medical Telemetry Service. This service consists of frequencies that were established by the Federal Communications Commission and have been set aside for medical uses only. Because neither land-mobile radios nor television are allowed to operate on these frequencies, they are safe from radio frequency interference that previously posed serious risk to medical telemetry equipment. Based in Issaquah, Washington, with regional offices spanning the globe, the company is leading the way into the 21st century with the introduction of the Intesys Clinical Suite (ICS), a set of solutions that enables ubiquitous access to patient information. One component of this suite is the Vital Signs Viewer, which allows physicians to see a patient’s live waveforms remotely from any networked personal computer located outside of a hospital, such as a laptop set up in a physician’s offsite office or home. Another component is the Clinical Event Interface (CEI), which advises caregivers of patient status or patient alarms, via advanced communication devices. Spacelabs Medical has also introduced a new, wireless networking option for its Ultraview SL compact, bedside patient monitors. Forty-eight years after opening its doors to develop technology for NASA, Spacelabs Medical’s health care expertise has once again been called upon by the Space Agency. Under contract to Johnson Space Center, it recently performed field tests of space-related telemetry equipment for use in disaster-response situations on Earth. Flexport®, WinDNA®, and Ultraview® are registered trademarks of Spacelabs Medical, Inc.